Fraser M. 2014. Birds of the Cape of Good Hope Nature Reserve, South Western Cape, South Africa. Ornithological Observations 5: 139-247. Summary. This report describes the birds of the Cape of Good Hope Nature Reserve (now the southern section of the Table Mountain National Park), South Africa. A total of 279 species has been recorded, at least 80 of which have bred. An impressive range of national and regional rarities has occurred, including first and second records for Africa and South Africa, and as many as 20 species new to the south-western Cape. The Reserve as a whole supports relatively low numbers and species-richness of bushbirds because of the generally sparse, exposed, and nutrient-deficient nature of the dominant fynbos vegetation. Small areas of coastal thicket support densities of birds up to 50 times greater than some inland fynbos habitats. Large numbers of nectar-feeding birds gather seasonally at flowering ornithophilous plants, especially proteaceous and ericaceous shrubs. Freshwater birds are scarce in the few blackwater vleis, streams and seeps. Palaearctic migrant waders formerly were a feature of the coast in summer and on passage but are now rare. Sanctuary areas on beaches closed to the public are of increasing importance to breeding White-fronted Plover and African Black Oystercatcher and to roosting shorebirds and terns. The tip of the Reserve provides some of the best land-based seawatching in the world, with a high diversity and abundance of pelagic seabirds coming close to shore under suitable conditions. The majority of observations detailed here were made in 1984-96; more recent records have been added where possible. As well [as] updating previous lists, this account provides an historical snapshot and a baseline that will allow new assessments of the Reserve's birds to be made in a local and regional context. It also enables visiting birders to evaluate their sightings, as many species that are common within a few kilometres of the Reserve have not yet been recorded in it. The apparent absence of such species is a consequence of local conditions and/or birders not appreciating their local significance. This paper provides a comprehensive introduction to the study area, provides an annotated list of species and ends with a Checklist (Appendix 1) and list of a few doubtful species. Weaver species are: Cape Weaver, Southern Masked Weaver, Red-billed Quelea, Southern Red Bishop, Yellow Bishop, and White-winged Widowbird (single record). 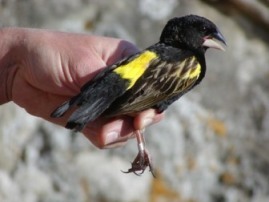 Only the Yellow Bishop is a common resident. The White-winged Widowbird is listed as the first for the province, but was actually beaten by 2 weeks by a bird from Robertson (Promerops 271:20-22, p21) on Easter weekend (ie 6-9 April 2007).